Revenue are planning to withhold tax repayments and Tax Clearance Certs from VAT-registered businesses, who fail to submit an obscure statistical return of VAT sales and purchases. 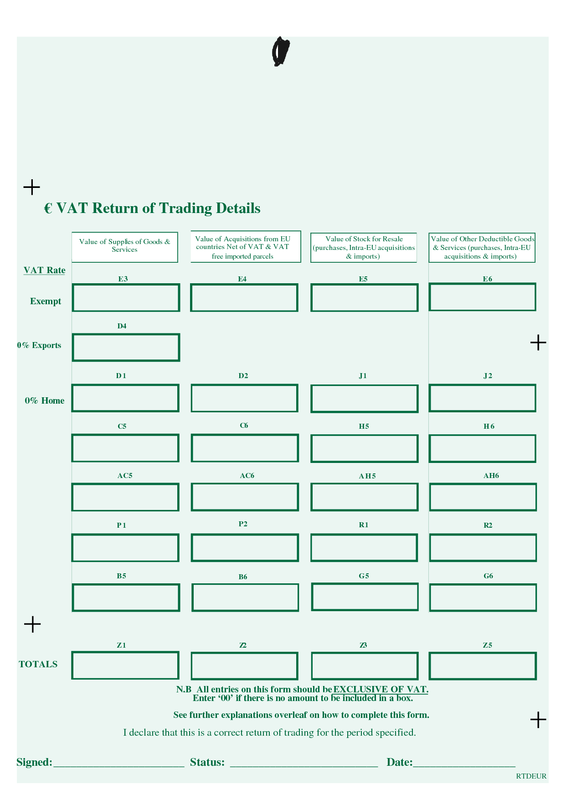 The VAT ‘Return of Trading Details’, or RTD, is a mandatory form which requires each business to record their annual aggregate sales and purchases totals for each VAT rate. The RTD was introduced in the early 1990s as part of the reforms to the VAT system following the adoption of the EU Single European market in 1992. In those days, it was regarded as a very important form, as it enabled Revenue to monitor business sales and purchases for audit purposes, and compare respective totals against the corresponding figures in business accounts. However, the RTD seemed to fall into disfavour about 15 years ago, with dwindling numbers of businesses bothering to file it each year subsequently. This non-compliance never seemed to bother Revenue too much, and it became increasingly rare for Revenue demand completion and submission of RTD’s, or to refer to RTD’s in official correspondence. This has all changed with today’s Revenue eBrief, unveiling new plans to enforce RTD completion and filing. This includes a new, “simplified” RTD, to be launched in late 2013, with local tax districts enforcing full compliance with RTD requirements from 1 September 2013. Next Post: Are All Our Income Tax Eggs in the One Basket? truly enjoyed surfing around your weblog posts. After all I’ll be subscribing for your rss feed and I’m hoping you write once more very soon! paramedics, fire fighters, elementary first aid etc. Jam Along DVD & CD with over 20 songs in various styles for practice. shades and tones and sustainability while nylon strings are not recommended. Sims 5 Split. With all the Sims some Discharge with this Fracture will provide you with the most beneficial Sims some Experience doable, we all assurance it. Please keep uus uup to date like this. Thanks foor sharing. to France, eliminating in the Paris suburb associated with Argenteuil. A superb soccer player in his youth, Patrick first decided upon the idea of being singer after seeing Michel Sardou perform in 75.
accent for his motion picture Le Coup fuente Sirocco. found Gérard Presgurvic, later to be his primary songwriter. Patrick first chosen the idea of like a artist after seeing Michel Sardou perform in 75. Hey thuere would you mind letting mme know which web host you’re working with? I’ve loaded your blog in 3 coompletely different browsers and I must say this blog loads a llot quicker then most. Appreciation to my father who stated to me about this webpage, this web site is truly amazing.